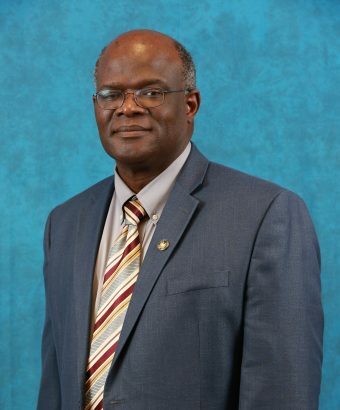 Peter A. Dumbuya, J.D., Ph.D.
Ph. D.: History, University of Akron, Akron, Ohio, December 1991. M. A.: History, University of Akron, Akron, Ohio, May 1986. Fields: Early America, Latin America, Early Modern Europe/Russia. Diploma in Education: Fourah Bay College, University of Sierra Leone, December 1982. B. A. (Honors): History, Fourah Bay College, University of Sierra Leone, December 1980. Fields: Sub-Saharan Africa, United States, Modern Europe, World History. August 2011-present: Tenured Professor of History, Fort Valley State University, Fort Valley, Georgia. June 2006-2008: Reader, College Board Advanced Placement (AP) in United States History. August 2000-2005: Assistant Professor of History, Fort Valley State University, Fort Valley, Georgia. January 1993-December 1997: Adjunct Professor of History, Auburn University at Montgomery, Montgomery, Alabama. January 1992-May 1999: Assistant/Associate Professor of History, Tuskegee University, Tuskegee, Alabama. January-December 1991: Part-Time Instructor of History, University of Akron, Akron, Ohio. September 1983-December 1990: Teaching/Research Assistant, Department of History, University of Akron, Akron, Ohio. September 1980-June 1983: Teacher of History/Government, St. Edward’s Secondary School, Freetown, Sierra Leone; Instructor of History/Government, Republic of Sierra Leone Military Forces, Freetown, Sierra Leone. July-August 2007: Worked in Presidential Campaign of Hon. Ernest Bai Koroma, President of the Republic of Sierra Leone. December 1999-April 2000: Criminal Background Researcher in Macon County, Alabama, for Kroll Background America, Nashville, Tennessee. September 1999-Present: Attorney at Law, State of Alabama (Phenix City, Alabama). Spring Semester 2011-present: Chair, BPRB Student Papers Committee, Fort Valley State University, Fort Valley, Georgia. Fall Semester 2010-present: Chair, Judicial Appeals Committee, Fort Valley State University, Fort Valley, Georgia. Presenter, 2010 Constitution Day, Fort Valley State University, September 17, 2010. Member, Reddick Scholarship Award Committee, Association of Third World Studies (ATWS), August 2010-present. Member, College of Arts and Sciences Promotion and Tenure Committee, Fall Semester 2007- present. Attended eCore Faculty Meeting and Training Workshop, Georgia Center for Continuing Education, University of Georgia, Athens, Georgia, May 9-10, 2007. Member, John W. Blassingame Scholarly Award Committee, Fort Valley State University, Spring Semester 2007. Member, Departmental Curriculum Committee, Fort Valley State University: Fall 2006-Present. Member, Faculty of Arts and Sciences Curriculum Committee, Fall Semester 2006-Present. Member, Fort Valley State University Faculty Senate: Fall Semester 2003-Summer Semester 2008. Member, International Studies Committee, Department of History, Geography & Political Science, Fort Valley State University: Fall Semester 2001-Fall Semester 2005. Member Georgia Center for Juvenile Justice Advisory Committee, Department of History, Geography & Political Science, Fort Valley State University: Fall Semester 2001-Fall Semester 2005. Member/Judge, Middle Georgia High School Quiz Bowl, Department of History, Geography & Political Science, Fort Valley State University: Spring Semester 2001-2004. Participated in Banks-Pierro-Rutland-Bellamy Social Sciences Colloquium, Department of History, Geography & Political Science, Fort Valley State University: Spring Semester 2001- Present. Participated in Ralph P. Malone Youth Motivation Task Force Program, Fort Valley State University: Spring Semester 2001-Present. Consultant (Language Training and History), IFESH Program, Office of International Programs, Tuskegee University: May 1993-May 1994. Tuskegee University Faculty Senator: September 1992-May 1995, and Secretary to the Faculty Senate: September 1993-May 1994. Academic Adviser, History Department, Tuskegee University: 1992-1999. Public Services Performed: Judge, Jones School of Law Third Year Law Students’ Mock Trial, Montgomery, Alabama, September 25, 2004. Member, Volunteer Lawyers Program, Alabama State Bar, 1999-Present. Judge, Alabama History Day, Auburn University at Montgomery, Montgomery, Alabama, March 1995-March 1998. Member, Fulbright Teacher Exchange Program, Alabama Regional Interview Committee, Montgomery, Alabama: December 1994-December 1997. Editorial Board Member, Alabama Lawyer: Summer 2002-Summer 2005. Editorial Board Member, Journal of the Georgia Association of Historians: Fall Semester 2001. Associate Editor, Sierra Leonean Newsletter: December 1995-1998. Georgia Humanities Council Grant: Islam and Terror: Confronting a National Tragedy in the Classroom,” a Symposium, August 23, 2002. Department of History, Geography & Political Science, Fort Valley State University. Alabama Humanities Foundation Grant: Summer Institute on World History, July 1993. Tuskegee University and Auburn University. United States District Court for the Northern and Middle Districts of Alabama. Fort Valley State University President’s Mini-Grant, Spring Semester 2009. Runner Up, Reddick Scholarship Award, Association of Third World Studies (ATWS), 2009, Ghana. Certificate of Recognition: College Board AP Reading, United States History Exam at Trinity University, San Antonio, Texas, June 2006, and June 2007. Certificate of Appreciation: Student-Athletes, Fort Valley State University: May 4, 2005. Certificate of Recognition: Distinguished Scholarship and Leadership award by the President, Association of Third World Studies: September 8, 2004. Certificate of Recognition: CHAMPS/Life Skills Program for Student-Athletes: Fort Valley State University: April 30, 2004. Jones School of Law: Dean’s List, Summer and Fall Semesters 1998; Best Paper, Conflict of Laws: Fall Semester 1998. Outstanding Faculty Performance Award for Research, Academic Year 1995-1996, Tuskegee University: April 19, 1996. Academic Challenge Grant, Department of History, University of Akron: for Ph. D. Dissertation Research in London and Geneva: January 1989. Teaching/Research Assistant, Department of History, University of Akron: September 1983- December 1990. Government of Sierra Leone Scholarship, Fourah Bay College, University of Sierra Leone: October 1976-June 1980; October 1981-June 1982. Phi Alpha Theta, International History Honor Society: Admitted 1983. Alabama State Bar: Admitted September 1999. Russell County (Alabama) Bar Association: Member since 2000. American Bar Association: Member 2000-2005. Association of Third World Studies, 2003-Present. Discussion on WPFW (89.3 FM, Washington, D.C.) Radio Pacifica Show, Africa Meets Africa, on Africa and its Place in the United Nations Security Council, May 5, 2005. Peter A. Dumbuya, et al., Assessing George W. Bush’s Africa Policy: and Suggestions for Barack Obama and African Leaders. New York: iUniverse, 2009. Peter A. Dumbuya, Reinventing the Colonial State: Constitutionalism, One-Party Rule, and Civil War in Sierra Leone. Lincoln: IUniverse, 2008. Peter A. Dumbuya, et al., Stakes in Africa-United States Relations: Proposals for Equitable Partnership. Lincoln: iUniverse, 2007. Peter A. Dumbuya, Tanganyika Under International Mandate, 1919-1946. Lanham: University Press of America, 1995. Gender, Violence, and Reconstruction in Post-War Sierra Leone. In Gender, Sexuality, and Mothering in Africa. Edited by Toyin Falola and Bessie House-Soremekun, 169-198. Trenton: Africa World Press, 2011. A Historical Review of United States-African Relations during the Presidency of George W. Bush. In Assessing George W. Bush’s Africa Policy: And Suggestions for Barack Obama and African Leaders. Edited by Abdul K. Bangura, et al., New York: iUniverse, 2009. The United States and West Africa: The Institutionalization of Foreign Relations in an Age of Ideological Ferment. In The United States and West Africa: Interactions and Relations. Edited by Alusine Jalloh and Toyin Falola, 237-254. Rochester: University of Rochester Press, 2008. Historical Overview of Africa-United States Relations. In Stakes in Africa-United States Relations: Proposals for Equitable Partnership. Edited by Abdul K. Bangura, et al., 3-20. Lincoln: iUniverse, 2007. Mandates: League of Nations and United Nations. In Encyclopedia of African History. Edited by Kevin Shillington, 933-935. New York: Fitzroy Dearborn, 2005. Civil War and Erosion of State Sovereignty in Africa: Overcoming Challenges to Democracy in Sierra Leone. Skepsis: A Journal for Philosophy and Inter-Disciplinary Research XXII/iii (2012): 207-233. Post-Conflict Reconstruction, Stabilization, and Nation-Building in an African State: The 2007 Presidential and Parliamentary Elections in Sierra Leone. Journal of Third World Studies XXVIII, No. 2 (Fall 2011): 143-159. Thomas de Saliere Tucker: Reconciling Industrial and Liberal Arts Education at Florida’s Normal School for Colored Teachers, 1887-1901. The Florida Historical Quarterly 89, No. 1 (Summer 2010): 26-50. ECOWAS Military Intervention in Sierra Leone: Anglophone-Francophone Bipolarity or Multipolarity?” Journal of Third World Studies XXV, No. 2 (Fall 2008): 83-102. In the Eye of the Budget Storm: A Profile of Judge Albert L. Johnson. Addendum (August 2004:1). Terrorist and Hate Groups: A Primer for Lawyers. The Alabama Lawyer 64, No. 6 (September 2003): 296-299. Profile: Judge Michael J. Bellamy. Addendum (October 2003): 1. Vindicating International Humanitarian Law in the Absence of Chapter VII Authority: The Special Court for Sierra Leone. ATWS Proceedings: Twenty-First Annual Meeting, Association of Third World Studies. (November 6-8, 2003): 25-31. Post-Election Peacemaking in Sierra Leone: Challenges and Opportunities for a Democratic Transition in the 1990s. Journal of the Georgia Association of Historians XXII (2001): 163-198. Coup d’état in Sierra Leone: A Setback for Democracy. Sierra Leonean Newsletter, No. 20, September 1997: 6-8. Anatomy of a Civil war: The Succession. Sierra Leonean Newsletter, No. 19, April 1997: 7-9. Anatomy of a Civil war: Political Unrest and the Succession Issue II. Sierra Leonean Newsletter, No. 17, October 1996: 6-8. Newsletter, No. 16, July 1996: 5-7. Sierra Leone: Anatomy of a Civil war II. Sierra Leonean Newsletter, No. 15, April 1996: 6-9. Sierra Leone: Anatomy of a Civil War. Sierra Leonean Newsletter, No. 14, December 1995: 9- 12. Ready or Not: Democracy in Sierra Leone. Sierra Leonean Newsletter, No. 13, August 1995: 11-13. Young Guns: A Political Nightmare. Sierra Leonean Newsletter, No. 12, May 1995: 7-10. Rwanda: Apocalypse Now. Sierra Leonean Newsletter, No. 10, November 1994: 6-8. Tamba Songu Mbriwa. Sierra Leonean Newsletter, No. 9, July 1994: 15-17. Newsletter, No. 8, March 1994: 10-13. A Farewell to Dictatorship? Sierra Leonean Newsletter, No. 7, December 1993: 4-6. The Somali Crisis and the UN: The Case of the Almost Forgotten Cold War Proxy. Sierra Leonean Newsletter, No. 5, May 1993: 5-7. Sierra Leone: New Directions for the 1990s and Beyond. Sierra Leonean Newsletter, No. 4, February 1993: 6-8. Reflections on the Bolshevik Revolution. Sierra Leonean Newsletter, No. 4, February 1993: 8-9. Waiting for Robert Mugabe. April 2008. What Raila Odinga Should Have Done. March 2008. Malaria Medicine: Build Better Mosquito-Busting Homes. March 2008. What an Obama Presidency Would Mean for Africa-U.S. Relations, Part I. July 2008. In Sierra for the 2007 Elections, Part II: Issues and Strategies. February 26, 2008. In Sierra Leone for the 2007 Elections. January 28, 2008. Edward Demenchonok, ed., Between Global Violence and the Ethics of Peace: Philosophical Perspectives (Malden: Wiley-Blackwell, 2009): Journal of Third World Studies (Spring 2012): 351-353. Edward Demenchonok, ed., Philosophy After Hiroshima (New Castle Upon Tyne: Cambridge Scholars Publishing, 2010): Journal of Third World Studies (Spring 2012): 356-358. Jamie Monson, Africa’s Freedom Railway: How a Chinese Development Project Changed Lives and Livelihoods in Tanzania (Bloomington: Indiana University Press, 2009): American Historical Review (February 2010): 326-327. John W. Harbeson and Donald Rothchild, eds., Africa in World Politics: Reforming Political Order, Fourth Edition (Boulder: Westview Press, 2009): Africa Today, Vol. 55, No. 4 (Summer 2009): 140-143. Amos J. Beyan, African American Settlements in West Africa: John Brown Russwurm and the American Civilizing Efforts (New York: Palgrave Macmillan, 2005): Journal of Third World Studies (Spring 2009): 183-185. Michael Jackson, In Sierra Leone (Durham: Duke University Press, 2004): Journal of Third World Studies (Fall 2007): 209-212. Georges Nzongola-Ntalaja, The Congo From Leopold to Kabila: A People’s History (New York: Zed Books, 2002): History: Review of New Books (Fall 2002): 38. Susan Geiger, TANU Women: Gender and Culture in the Making of Tanganyikan Nationalism, 1955-1965 (Portsmouth: Heinemann, 1997): International Journal of African Historical Studies, Vol. 30, No. 3 (1997): 607-608. H. L. Wesseling, Divide and Rule: The Partition of Africa, 1880-1914 (Westport: Praeger, 1996): History: Review of New Books (Spring 1997): 131-132. Crawford Young, The African Colonial State in Comparative Perspective (New Haven: Yale University Press, 1994): The Historian, Vol. 58, No. 4 (Summer 1996): 853-854. Sahr John Kpundeh, Politics and Corruption in Africa: A Case Study of Sierra Leone (Lanham: University Press of America, 1995): Sierra Leonean Newsletter, No. 16 (July 1996): 19. William Reno, Corruption and State Politics in Sierra Leone (Cambridge: Cambridge University Press, 1995): Sierra Leonean Newsletter, No. 15 (April 1996): 14-15. Elizabeth A. Eldredge, Fred Morton, eds., Slavery in South Africa: Captive Labor on the Dutch Frontier (Boulder: Westview Press, 1994): History: Review of New Books (Fall 1995): 40. Elizabeth Schmidt, Peasants, Traders, and Wives: Shona Women in the History of Zimbabwe, 1870-1939 (Portsmouth: Heinemann, 1992): The Historian, Vol. 57, No. 3 (Spring 1995): 588- 589. Rwanda: Letter to the Editor cited in “Roots of Chaos,” Newsweek, August 22, 1994: 12. Empty Sermon, West Africa, August 28-September 3 1989: 1436. Academics Over Football, Buchtelite (University of Akron), November 20, 1986: 4. South Africa: An Issue of Freedom, Buchtelite (University of Akron), May 7, 1985: 3. Continuity or Change in US Relations with Africa during the Obama Presidency. The 30th Annual Conference of the Association of Third World Studies (ATWS). Berry College, Rome, Georgia, October 11-13, 2012. Civil War and Erosion of State Sovereignty in Africa: Overcoming Challenges to Democracy in Sierra Leone. Ninth World Congress of the International Society for Universal Dialogue (ISUD), Olympia, Greece, June 22-27, 2012. Corruption and Underdevelopment in Sierra Leone: Domestic Politics and International Accountability. The University of Texas Africa Conference, Austin, Texas, March 30-April 1, 2012. Africa and Brazil: Race, Culture, and Diplomacy during the Presidency of Luiz Inacio da Silva. The 29th Annual Conference of the Association of Third World Studies (ATWS), Salvador da Bahia, Brazil, November 20-23, 2011. Reverse Migration and State Formation in West Africa. The 29th Annual Conference of the Association of Third World Studies (ATWS), Salvador da Bahia, Brazil, November 20-23, 2011. Restorative Justice Approaches in Postwar Sierra Leone: A Model for Postwar Reconstruction in Africa? Africa in World Politics: The University of Texas Africa Conference, Austin, Texas, March 25-27, 2011. Combating Corruption in Sierra Leone: Domestic Politics and International Accountability. The 28th Annual Conference of the Association of Third World Studies (ATWS), Savannah, Georgia, October 7-9, 2010. US Relations with Ghana: Rethinking Kwame Nkrumah and the Communist Threat During the Cold War. The 28th Annual Conference of the Association of Third World Studies (ATWS), Savannah, Georgia, October 7-9, 2010. Henry S. Sanford and the Colonial Question in Africa: Personal Diplomacy and Structural Adjustment in United States Foreign Policy. 2010 Annual Meeting of the Florida Historical Society, St. Augustine, Florida, May 27-29, 2010. “Operation Liberate the Motherland”: Gender, Violence, and Reconstruction in Postwar Sierra Leone. Tenth Annual Africa Conference at the University of Texas at Austin, March 26-28, 2010. Territorial Origins of African Civil Conflicts: Erosion of the State Sovereignty Concept in Sierra Leone. International Conference on Territorial Origins of African Civil Conflicts, Organized by Conflict Transformation Program (School of Politics), University of KwaZulu-Natal, and Center for African Studies, Ohio State University, Pietermaritzburg, South Africa, January 29-30, 2010. Recent Elections in Africa: The 2007 Presidential and Parliamentary Elections in Sierra Leone. Twenty-Sixth Annual Conference of the Association of Third World Studies (ATWS), Millersville University, Pennsylvania, October 26-28, 2008. British Foreign Policy and the Re-Invention of the Security Forces in Sierra Leone: A Model for Collapsed States? Southern Conference on British Studies, Birmingham, Alabama, November 16-18, 2006. Children at war: International and Domestic Law Implications. Twenty-Third Annual Meeting of the Association of Third World Studies (ATWS), Santo Domingo, Dominican Republic, November 20-22, 2005. Chaired Session I: Democracy, Globalization, and the State in Africa. Twenty-Third Annual Meeting of the Association of Third World Studies (ATWS), Santo Domingo, Dominican Republic, November 20-22, 2005. Historical Overview of Africa-United States Relations. Twenty-Fourth Annual Meeting of the Association of Third World Studies (ATWS), Winston-Salem, North Carolina, November 2-4, 2006. Panel Discussion: Brain Drain, Brain Gain, or Brain Circulation: The Case of Africa (Focus on Travails and Other Challenges). Twenty-Fourth Annual Meeting of the Association of Third World Studies (ATWS), Winston-Salem, North Carolina, November 2-4, 2006. United States and Africa: The Institutionalization of Foreign Relations in an Age of Ideological Ferment. International Conference on the United States and West Africa. Africa Program, University of Texas at Arlington, April 28-30, 2005. The Restoration and Maintenance of Law and Order in the Mano River Tri-States Region. African Studies Association, New Orleans, Louisiana, November 11-14, 2004. The Age of Internationalism: British Foreign Policy and Conflict Resolution in Sierra Leone. Southern Conference on British Studies, Memphis, Tennessee, November 4-6, 2004. ECOWAS Military Intervention in Sierra Leone, 1997-1998: Rethinking the Anglophone- Francophone Divide in West African International Relations. Twenty-Second Annual Meeting of the Association of Third World Studies (ATWS), Macon, Georgia, October 7-9, 2004. Chaired Session 1: Conflict and Conflict Resolution in West Africa. Twenty-Second Annual Meeting of the Association of Third World Studies (ATWS), Macon, Georgia, October 8, 2004. Vindicating International Humanitarian Law in the Absence of Chapter VII Authority: The Special Court for Sierra Leone and Third States. Twenty-First Annual Meeting of the Association of Third World Studies (ATWS), Louisiana State University in Shreveport, Louisiana, November, 6-8, 2003. Interdisciplinary Roundtable on African Studies (SIRAS), Kentucky State University, Frankfort, Kentucky, March 27-29, 2003. Punishing Genocide and Other War Crimes in Rwanda and Sierra Leone: A Comparative Analysis. Conference on Internalist vs. Externalist Interpretations of African History and Culture, Organized by Society of Research on African Cultures (SORAC), Montclair State University, Upper Montclair, New Jersey, November 7-9, 2002. History of Islam From Its Origins in Arabia in the 7th Century to the Present. A Symposium on Islam and Terror: Confronting a National Tragedy in the Classroom for Teachers, Fort Valley State University, Fort Valley, Georgia, August 23, 2002. Perspective. The Southern Interdisciplinary Roundtable on African Studies and the Black Expressive Cultures Studies Association, Kentucky State University, Frankfort, Kentucky, April 12, 2002. Post-Election Peacemaking in Sierra Leone. National Organization of Sierra Leoneans in North America, Inaugural Convention, Howard University, Washington, D. C., March 28, 1998. The Congo Crisis and the Cold War. APSIA-Woodrow Wilson National Fellowship Foundation Senior Institute on International Affairs, School of Foreign Service, Georgetown University, Washington, D.C., June 14, 1995. The Rise of Modern Nationalism in Africa. Alabama Humanities Foundation Summer Institute on World History, Tuskegee University, July 7, 1993. Southern Africa: From Boers to Colonialism. Alabama Humanities Foundation Summer Institute on World History, Tuskegee University, July 6, 1993. The United States, Great Britain, and the “B” Mandates in Africa, 1919-1925: The Road to Confirmation. Ohio Academy of History, Spring Meeting, Dayton, Ohio, April 11-12, 1992.